Poison ivy and potentially psoriasis? Fun! Somebody bought a new toy. why don’t you just use your iPad to e-read? 1. Battery life for eInk Kindle is much better than iPad. iPad lasts a few days, Kindle weeks. 2. No screen glare on Kindle. 3. Kindle is for reading, I am easily distracted and am trying to force myself to read. I wonder if you can find childrens books in German on the Kindle? And you should have asked- I’m sure ours will never be used again… I know they are not much, but still. Last nights’ adventure in pet ownership was with Tate R. Tot. I had let him out yesterday as I left for work. Debbie had not seen him all day and was worried. About 9PM she finally locates him, about 30 feet up in a large oak tree. And that’s the lowest branch and my ladder is only 20 feet. Neverless, up the ladder I go to pursuade him to join me… but to no avail. We even wrapped the top of the ladder with a beach towel (for traction) and held the ladder up to him- nope, sorry. Too dark to do any front end loader and ladder feats of daring, we bid him goodnight and went inside. Just before bed, I opened the door to check on him and he marches up the steps of the deck. He just didn’t want to say he didn’t need out help on the ladder. F’er. As the fire department says when they will not rescue a cat from a tree – They will come down when they get hungry. And they also say, have you ever seen a cat skeleton in a tree? they thinkt hey are so funny. We had a fairly big 40th birthday dinner party for my friend Sue last night. Great dinner & lots of wine & up too late, so I’m tired today. Debbie thought we should call the FD and I laughed. 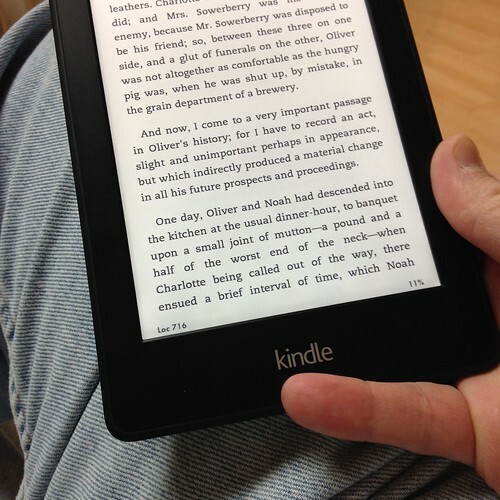 I bought a reconditioned Kindle Paperwhite, it was only $89, the purchase was a knee-jerk reaction. I have about eight “easy reader” German ebooks already. With the Kindle with me constantly I am hoping to read these more often as well.